You’ve probably already heard that we are raising the most overweight, out-of-shape generation of children in history. On January 21, 2011, the Centers for Disease Control and Prevention (CDC) released another round of figures. What is amazing is that the problem isn’t staying the same, but keeps increasing, year after year. There was no increase between 1960 and 1980, but since 1980, the percent of overweight children has been rising dangerously. According to the CDC, 17% or 12.5 million children and adolescents are obese. Obesity among children is literally an epidemic. Unless we get kids moving and teach them to enjoy healthy foods, the outlook for their long-term health is bleak. But we can change things. Tobacco use was once thought to be inevitable; now its use has fallen by half. Wouldn’t it be wonderful for all of us, children and adults, if weight problems fell by half over the next several years? Obesity, or over-nutrition, is the generalized accumulation of fat both beneath the skin and throughout the body. Some children are big, or stocky, because they have large skeletal frames. They are not obese. There are general guidelines for appropriate weight for a given height, but these are only general guidelines. Obesity is usually caused by an individual’s eating more food than is necessary for him or her. Less activity than the individual needs can also cause obesity, but this is less common in children. 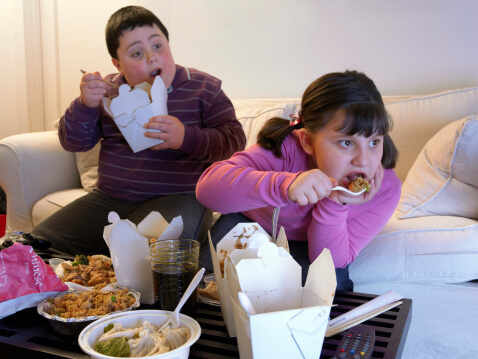 Whatever the cause, certain children inherit a genetic predisposition to obesity. They may eat the same diets as thinner children, but store more of the calories as fat. The body stores new fat either by increasing the number of fat cells or by increasing the size of existing cells. It is particularly important to control childhood obesity since new fat cells are primarily formed during childhood. Each year of adding these extra fat cells makes adult obesity more difficult to fight. Overweight children are not gluttonous or lazy. In fact, many studies have shown that obese children do not eat more calories than their peers. And by measuring caloric expenditure using the double-labeled water method, investigators have shown that obese children actually expend more energy than their non-obese counterparts. Obese children need less food and more activity than their peers. A variety of hormonal disorders, including problems with insulin, hypothalamic hormones, and pituitary hormones, can cause severe obesity. There are also a number of rare inherited syndromes (such as Laurence-Moon-Biedl, Prader-Willi, and Cushing) that produce obesity. If a child’s height is appropriate or advanced for her age, one of these underlying medical conditions is extremely unlikely. On the other hand, an obese child with slow height growth should certainly be evaluated. Is your child overweight? Underweight? A study in the July 2000 issue of Pediatrics shows us that, at least when it comes to teens, both parents and children are surprisingly poor at judging appropriate weight. Forty-seven percent of teens who reported that they were very overweight were not obese at all, according to objective body mass index (BMI) calculations. But among teens who were objectively obese, most parents and most children themselves did not recognize it! Obesity can lead to many other health problems, including diabetes, high blood pressure, and asthma. In fact, with the increase in childhood obesity, we are also seeing an alarming increase in the rate of adolescent high blood pressure, high cholesterol, and diabetes! No – but the behavior that leads to obesity can be contagious or cultural. Obesity tends to get worse over time, unless intentional steps are taken to change basic habits of activity and diet. The CDC growth charts are an excellent mirror that can help us see accurately how our children are growing. The BMI curve, in particular, can give us an early warning even before a child is truly overweight or underweight. Sometimes we need to take a more objective look at our kids. Obesity can be very difficult to treat, since it involves permanently changing basic eating and exercise habits. Successes almost always involve changing the whole family’s habits to those that are appropriate for the obese child. Cutting excess intake is best achieved by first keeping a careful record of food consumed, to identify particular problem areas in the diet. The entire family must learn which foods are healthy. Whole fruit, whole vegetables, and whole grains should make up the bulk of the diet. Parents need to know that white bread vs. whole wheat is not a trivial question. Whether or not children eat whole grains could have a major impact on their health. A study in the August 2002 issue of The American Journal of Clinical Nutrition analyzed data from the large, ongoing Framingham Offspring Study. The study found that after adjusting for other variables, there remained a strong correlation between the amounts of whole grain consumed over a four year period, and healthier weight, healthier waist-to-hip ratio, and decreased risk for diabetes. This was true no matter how much refined grain was eaten, and no matter how much fiber. While changing eating habits, the family also will benefit from changing their active play habits. Whatever the daily activity level of the family, it should be modestly increased. A January 2000 report to the Centers for Disease Control and Prevention (CDC) identified the single most powerful change teens can make to bring their weight under control. “Of all the ways of tackling this problem, TV reduction appears to be the most effective measure in reducing weight gain in this population,” Dr. William Dietz, Director of the Division of Nutrition and Physical Activity, told the CDC Advisory Board. Bike, dance, play ball – have fun being active! Most families are not able to make these lasting changes on their own, and will benefit from meeting with an independent party at least once a week for 12 weeks. Ideally, this outside individual should be a nutritionist or an expert in weight management, but even a committed friend will do. In many cities, pediatric weight management programs such as Shapedown are available and are very effective. Whatever the source, monitoring should continue at least monthly for the remainder of the first year, and then every 3 to 4 months until the new habits have become very deeply ingrained. I often ask my patients to think of one healthy change they can make in their lives, starting today. Then, my role is to “cheer” them on, encouraging them every few weeks to add another lifestyle change while monitoring their weight and any associated health problems. Whether your child is a baby or a teen, now is the best time to be sure that active, physical play is a part of her life for at least 30 minutes every day. According to the CDC, childhood obesity in the US has tripled since 1980. Guidelines released by the National Association for Sport and Physical Education draw on evidence of benefit from over 40 scientific studies to urge those caring for children to be mindful each day of encouraging movement and motor skills. The guidelines were updated in 2009 for children under age 5, and in 2004 for children 5-12 years old. School-age children should be engaging in at least 60 minutes of activity each day. Boring calisthenics are not what the doctor orders. Instead, look for anything fun that gets kids walking, running, rolling, balancing, jumping, kicking, throwing, or dancing. If they’re too young for these, engage them in tummy-time or playing with a rattle. One of our important tasks as parents is to teach a lifelong habit of active fun. A study published in the April 2001 issue of the American Journal of Public Health offers real hope. Children were 400% to 500% more likely to be physically active if they were given an attractive place to play and were supervised by adults. Among middle-school students, basketball hoops and courts, baseball backstops, volleyball nets, tennis courts, and racquetball courts made the biggest impact. Realistic changes in our schools, parks, neighborhoods, and homes can revolutionize the health of our children. Healthy eating habits can also prevent obesity. Babies who are breastfed have a 30 percent drop in their risk of obesity, according to a study published in the June 8, 2002 issue of The Lancet. This study looked at more than 32,000 children who were 3 to 4 years old. After adjusting for birth weight and socioeconomic status, those who had been breastfed were only 70 percent as likely as their formula-fed peers to have become obese. Breastfeeding is not a guarantee of a good outcome, but it does improve the odds for your child in many areas of life. Another important early tip: when babies are transitioning to solid foods, avoid putting cereal or solids in the bottle. Also avoid too much juice. For most children up to age 6, fruit juice should be limited to 4 to 6 ounces per day. For those 7 and over, 8 to 12 ounces per day is a good maximum. And juice does not belong in a baby bottle.